Henry the Young King, aged four and twenty, accompanied by his younger brothers, Richard, duke of Aquitaine and Geoffrey, duke of Brittany represented the House of Anjou at the coronation of his brother-in-law, Philip, later known as Augustus*. On All Saints’ Day, 1179, not yet fifteen-year-old Philip, following Capetian tradition, was anointed and crowned at the cathedral of Reims by the archbishop of Reims, William Whitehands [Guillaume aux Blanches Mains], his uncle. At the time of the ceremony, Philip’s father, Louis VII was yet alive, but “labouring under old age and a paralytic malady” unable to attend. Philip’s mother, Adela of Champagne was also absent, probably tending to her ailing husband. 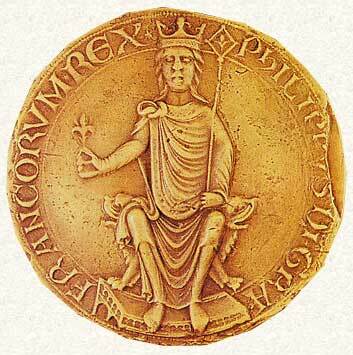 Henry the Young King carried Philip’s crown in the procession and supported his head during the coronation. In his Images of History Ralph of Diceto tells a story of how on the coronation the Young Henry, standing close behind his brother-in-law, had bent forward to hold the crown upon the boy’s head, and thus relieve him of its weight. ‘This implied’, Diceto observes ‘that if ever the French needed help they could safely ask for it from one who had helped at their king’s coronation’. Kate Norgate interprets this act of kindness as the symbol and harbinger of the later political attitude of Henry’s father towards the boy-king of France. But back to the young King himself, he had already bedazzled all the present with his retinue and most precious gifts for the new king, the fruit of his father, Henry II’s most unusual fit of generosity and largesse. The old king not only sent silver, gold and “the results of his hunting in England”, but also provided for his son’s journey so that the latter “accepted free quarters from no-one, either on the road thither or during the festival”. Also at the great tournament that followed young Henry outshone all other participants. The tournament was held at Lagny-sur-Marne** and was later described in detail by William Marshal’s biographer. Thanks to him we can learn that beside usual “… great noise and tumult … mighty blows … great clash of lances, from which the splinters fell to the ground” the Young King came in the company of eighty chosen knights “not merely chosen, but the pick of the chosen”. Later the author corrects himself giving the number of “seven times as many” under the command of young Henry. Every knight in his service received twenty shillings a day for “each man he had with him”. The author sums up: “there were at least two hundred and more … who lived off the purse of the young King and were knights of his”. He also gives a fascinating account of how the Young King found himself in a great predicament, almost captured when left behind by his men, and his brother Geoffrey, who instead of protecting him chased after booty. It was William Marshal in the assistance of William de Preaux, who came to his rescue so that he ended up with his helmet torn from his head, but his face saved. It could all have ended in much more humiliating way. The Young King might have been captured and forced to pay a ransom. After the tournament Young Henry praised the Marshal saying that: “… never before had finer blows been witnessed from a single knight, or known of, as those dealt by the Marshal that day”. The author of the History of William Marshal also enumerates other prominent participants: Philip, count of Flanders, Young Henry’s relative, friend and one-time mentor, who acted as the young Philip’s “special official” (Diceto, p. 164), carrying the great sword at the coronation and later supervising the feasts, as always used his ingenious, albeit a little non-knightly technique at Lagny (it had nothing to do with the chivalry the way we understand it today)***; duke of Burgundy; and David of Huntigdon, the brother of the King of Scotland and many others, both French and English, all together three thousand knights. * Philip II gained his nickname “Augustus” because he was born in August [21 August 1165], and due to the fact that he “augmented” the commonwealth following in the footsteps of the Roman Ceasars adding the county of Vermandois to his domains (at the cost of Henry the Young King’s cousin Countess Eleanor of Beaumont-sur-Oise). He was first called “Augustus” by Rigord of Saint-Denis, the contemporary chronicler and Philip’s partisan. Fragments of The History of William Marshal translated by Stewart Gregory, with the assistance of David Crouch. Online resources. Kathryn, thank you! I'm so happy about this very first comment! Creating a blog was not so difficult after all:-) I'm going to continue the "serious stuff" on Henry's website, whereas here, well... will it be enough to say that I'm going to give vent to my imagination? Lovely to be here, Kasia, and I'm so glad you decided to start a blog! It's great.